The Wall Street Journal, March 2, 2013, Weekend. In 2003,Eric Hautemont was prowling the corridors of the World Boardgaming Championships, looking for a game. He and two partners had founded an old-fashioned cardboard, dice and wood board game company in Silicon Valley called Days of Wonder. Eventually, he and co-founder Mark Kaufmann sat down to play a prototype of a train-themed game—at the time, just a handmade piece of cardboard with line drawings. The game, made by a well-known designer named Alan R. Moon, had three basic rules and a simple goal: to collect the most points by connecting cross-country railway routes. Drew Kelly for The Wall Street Journal IN A GAME’S early stages, Mr. Hautemont—a lifelong fan of Asterix and Tintin comics—oversees designs by freelance illustrators. 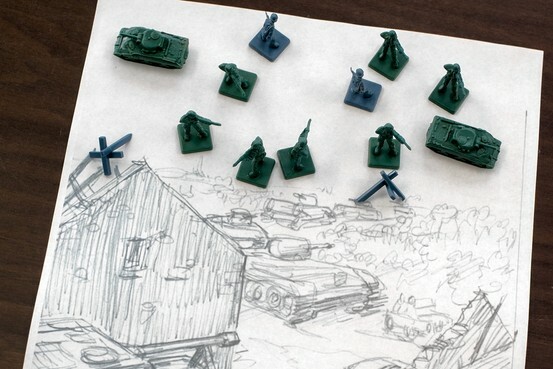 Here, a sketch for Memoir ’44. He and Mr. Kaufmann played for 10 or 15 minutes. After teaching them how it worked, Mr. Moon brushed the pieces off the board. The two players were disappointed: They didn’t want to stop. That game became Ticket to Ride—Days of Wonder’s second release and now the world’s best-selling train game, according to the company. It has sold more than two million physical copies since 2004, as well as more than 1.8 million copies of the digital version. The board game costs about $50, and the digital version costs $9.99. Last year, “Ticket to Ride” was one of the top paid board games in Apple’s app store. The physical game also won the 2004 Spiel Des Jahres—the game of the year award in Germany, where many of the most successful traditional board game makers are based. “It was the equivalent of an indie film winning the Oscar for best picture,” jokes Mr. Hautemont, 47, who was born in France but has lived in California since the late 1980s. Days of Wonder’s collection of more than a dozen games—geared to both adults and children—are now available in 30 countries. (Small World, in which wizards, giants and other fantasy creatures try to conquer the world, is another hit, with over 500,000 physical and digital copies sold.) The company has won more than 50 industry awards and had world-wide sales of about $15 million last year. A chess player who earned a master’s degree in applied mathematics and computer science, Mr. Hautemont has long loved games. Before starting Days of Wonder, he co-founded a 3-D-software firm and had a successful career as a venture capitalist. He decided to focus on board games instead because “I cared more about having work my kids could relate to,” he explains. He is the father of two teens. “I like making products—things I can touch and enjoy,” he adds. After buying the rights to a game, Mr. Hautemont and his colleagues begin by choosing the game’s title, atmosphere and rules. They then oversee the manufacturing of the wood, resin and plastic game pieces and the cardboard playing surface. As avid fans of comic books and animated movies, he and his colleagues share a graphics culture that helps them to decide on the visual look of the game. After that, they move on to developing a bill of materials—a list of the various components they need, such as the bell for mass in their first game, from 2003, called “Mystery of the Abbey.” For that, they found a small metal bell that players can ring. Unlike many other game companies, Days of Wonder develops all of its digital games itself, rather than hiring an outside firm to do it. The company has sold more than two million copies across its three biggest digital games. Mr. Moon, who has sold his prototypes to some of the world’s leading board game companies, is happy with the iPad version of his game. “That’s their real strength. They get the importance of the online version,” he says. Mr. Hautemont believes his experience in the technology world has helped him as a board-game maker. “Constraints are good,” he says, and that philosophy led him to vow that he would never have more than 20 employees. Days of Wonder is based in Los Altos, Calif., but has most of its staff in Paris. The company currently employs 16 people. Drew Kelly for The Wall Street Journal Sketches and game pieces for a game designed by Eric Hautemont. He doesn’t want to publish more than a game a year—a go-slow strategy designed to help the designers focus on quality. Typically, board game companies publish dozens of new games a year. 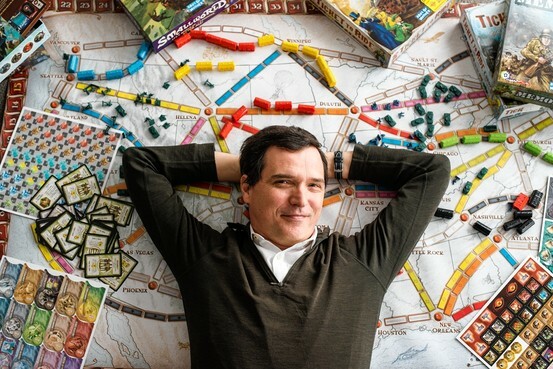 “When you only do one board game a year, you’d better make it right,” he says. Going slow helps him spend time on small details that game buyers might not initially notice, such as the shape and feel of the pieces. Most are made in China to Mr. Hautemont’s specifications, down to the size of the windows on the trains. It also lets employees indulge their playful side: In Memoir ’44, a World War II game that has sold over 400,000 physical and digital copies, Mr. Kaufmann sneaked in a photo of Mr. Hautemont as one of the generals.